Unit24 is pleased to announce 'Organic' ' Ewa Goral's solo exhibition, which presents a series created during the years 2011 ' 2013. Each project ' period in her activity consists of multiple works grouped around specific themes and meanings. The last period is dominated by the floral world. Inspired by the fantastic world of nature the artist attempts an exploration of wildlife. 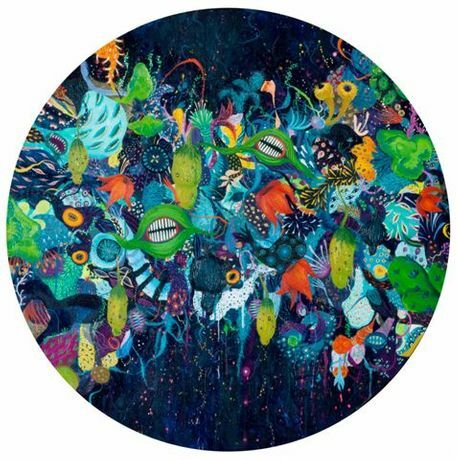 The floral series, which has been painted on the round canvas, emphasises the cyclical nature of vegetation. The author transforms most of the represented objects. One will definitely not find here the classic still nature in a vase. The aim is to discover the secret, 'human' life of flora. The series was primarily inspired by the artist's travel to India, where she also developed an interest in botanical literature and art. Her drawings are inspired by great creations from the past, amongst them classic works of the philosopher, biologist and traveller Ernst Haeckel or the more contemporary, psychedelic representations of wildlife such as a music video of the Californian band, Sun Araw, directed by Cameron Stallone and Daniel Brantley. The whole concept is driven by the idea of discovering a hidden, dark side of the floral world. Dangerous and beautiful plants, seductive and mysterious like a femme fatale, may at first appear to be decorative but in fact keep their obscure secrets underneath. The plants presented there have spikes and thorns, they may be colourful and attractive but may also cause death of a person, who would carelessly eat or touch them. The artist's intention is to let the spectator into this tempting world and help in its exploration. This could be taken as commentary on the contemporary world with its commercialism, advertising and the creation of a beautiful, fake reality. Ewa Goral was born in 1984. Her education credentials include graduating from a visual arts high school at Naleczow and willingly dropping out of the Krakow Fine Arts Academy (ASP). Instead of grimly scaling the ladder of academic attainment she has learnt the intricacies of creative graphic design while consistently developing an individual vision in painting, honed through self-discipline and a sense of independence, free of the leash professorial supervision and worn-out compositional rigidities. Goral's paintings have been exhibited in Berlin, London, Warsaw, Krakow, Bielsko-Biala and Tarnowskie Gory. She is now most often to be found at her studio on the grounds of the former Miraculum factory in Krakow, Poland.